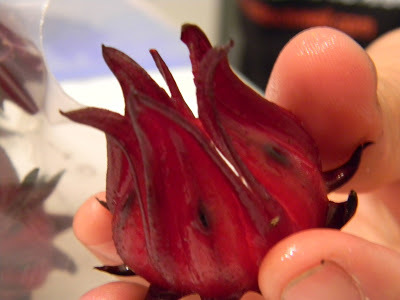 Jamaican sorrel is one of the coolest-looking edibles you can grow. And not only is it beautiful, it’s also delicious. Jamaican sorrel, also known as Florida Cranberry, is a member of the hibiscus family (which also includes okra) and like many hibiscus, has multiple edible parts. 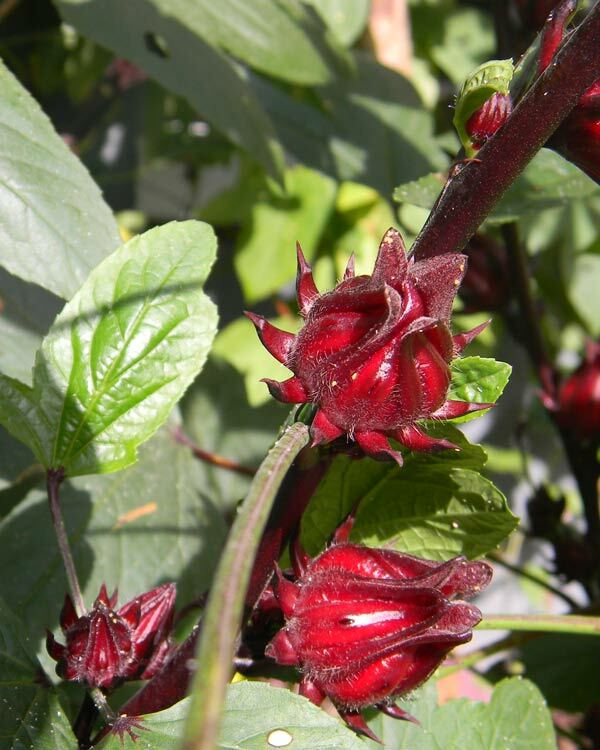 The blooms, leaves, and pods on this plant are all edible – but the reason most people grow Jamaican sorrel is for the calyxes. What is a calyx, you ask? It’s the pointy red bit at the base of the flower. After blooming, the flower withers and the pod inside the bud begins to swell. After a few days, the calyx around it is large and juicy – ready for picking. Perfect little “Invasion of the Bodysnatchers” pods! Chop the stem end off, slit one side and pop out the green fruit in the middle. (They’re like freaky little okra babies… I send them right out the door to the chickens.) Then save the calyxes in the freezer until Thanksgiving – they’re a dead ringer for cranberry, though not as bitter. My wife uses them interchangeably with cranberries in her sauce making… and the results are delicious. 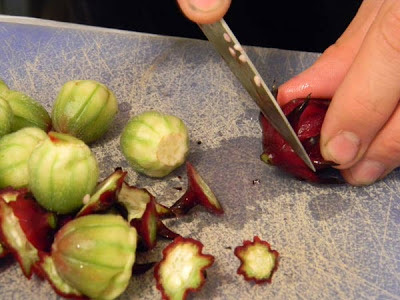 Check out Rachel’s Jamaican Sorrel Cranberry Relish recipe! The light cycle effects when these start their blooming, so keep that in mind. You’ll have lovely flower-less bushes until sometime in October, then the blooms arrive in profusion. 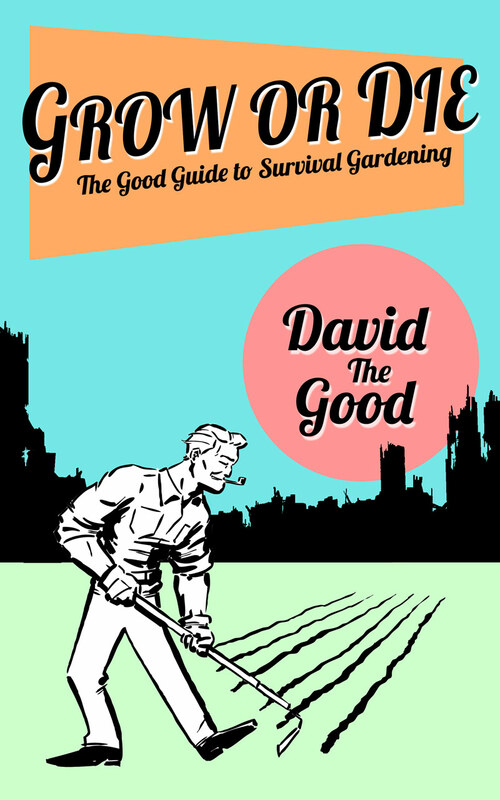 Pick regularly to keep the plant going, which it will until frost. Another great thing about these plants: the leaves are delectable. They’re a lemony-tart and satisfying flavor that’s perfect in Caesar salads. Try it – they’ll blow your mind. That is, if it’s not already blown by the plant’s gorgeous blooms. Tip: start these guys from seed in the spring, then transplant out. They’ll grow like crazy with a little care. 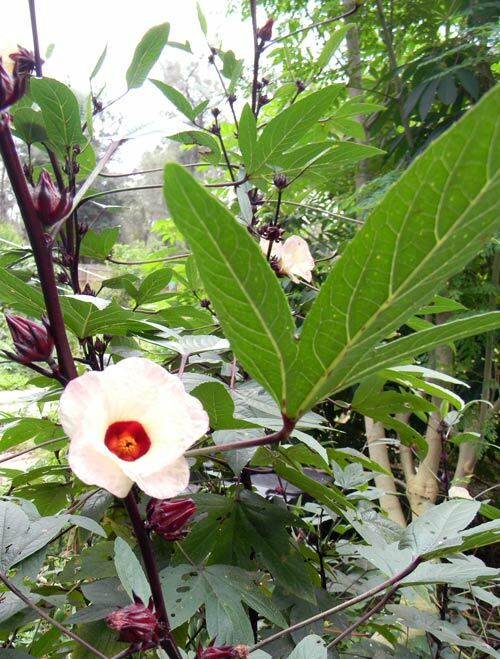 Finally, Jamaican sorrel seeds are available on ebay. Gotta love ebay. Storability: So-so. Preserve by freezing, jellying. 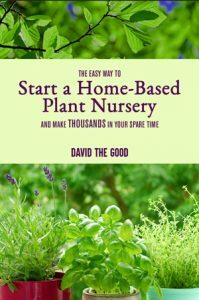 Florida Garden Consulting: Help My Homestead! Wow! what an attractive plant! Yeah. Isn't it amazing? They're works of art. I'm working on a short video about them… gonna post that soon. Just found your blog.Love it.If you get seeds,I'd love some. Sure thing – I'm hoping the frost won't hit too soon and they'll produce for me. Thanks for stopping by. You can find Thai red roselle seeds from rareseeds.com. It's the Baker creek family in Missouri that has been selling heirloom seeds for over a hundred years! They have a sparse number of physical locations to purchase their seeds, but they always take online orders. Very cheap too. I just started my seeds in starter cases, can't wait to see what pops up, looking forward to this beautiful plant. Their seeds have an excellent germination rate, too. Just planted a pack last week and they all came up. Thank you, Jen – I love SESE. The calyxes can also be made into tea. It gives the "zing" in zinger tea. I didn't know that the leaves are edible, will give them a try this year! Green Tree Farm-SC, LLC I grew Thai red roselle from seed this spring for the first time and they are beautiful plants. I am about to go out and harvest calyces for recipes I am researching. I tried to sell them from my small retail nursery, and although they were beautiful in their one gallon containers, they were basically unknown in SC and few sold due to lack of recognition. My seeds came from Southern Exposure Seed Exchange and I am harvesting my own from calyxes that were allowed to remain on the plant. I am experimenting, but will continue to grow at Green Tree Farm-SC, LLC in Sumter, SC. Thanks for sharing! I am from Guyana South America living in SC now. I happen to get seed from my sister in Arkansas and I got one plant . I have a beautiful loaded tree. We make sorrel drink but now I heard about using leaves in salad and making relish . Cramberry is my favorite so I have some plans . My biggest problem is the weather it starting to get cold so I brought my plant inside . What do you think can it take SC coldness? No – that cold will kill it quickly. It can’t even take light frosts. Mine died with the first real cold in North Florida and I was two zones warmed than you. The leaves are great in salads – and the relish is excellent! 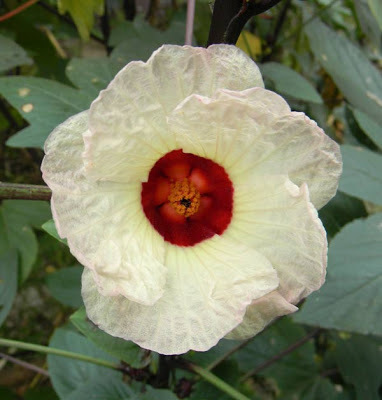 I just found some information online that this plant, and other members of the mallow family, including the commonly found perennial chinese hibiscus, are really good sources of dietary Vitamin C. Something to think about when preparing your survival garden, especially if you are unlucky enough, as I am, to live in an area of the state that is largely unsuccessful at growing most citrus. The only other really prevalent source of Vitamin C that I know of is pine needle tea, but i have heard mixed information about that. what are your vitamin C sources in your survival gardens? We drink pine needle tree here too, off our longleaf pines. The pod (you throw to the chickens?) is used to make Jamaica or hibiscus tea. 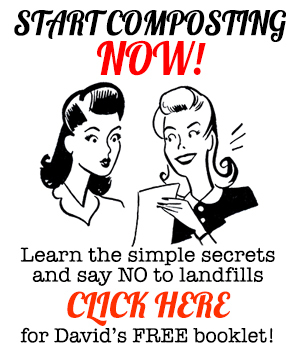 I think you throw away the best part! I bought seeds at Echo in Ft Myers. Growing up in San Diego all the mexican fast food place sold jamaica, horchata (rice milk) & tamarindo (bean pod). 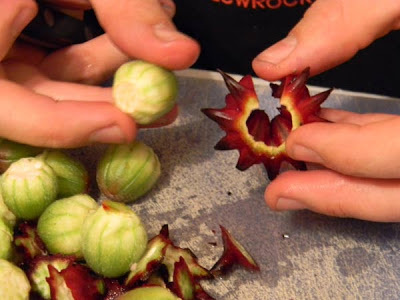 We throw the spiny green middles (which are the real seed pods) to the chickens and use the red calyx part… that's the hibiscus tea part. I originally got my seeds from ECHO too. Love those guys. I also love tamarind… I have one of those growing down south at my Dad's place. I was able to save some seeds at the end of the growing season last year, and this year they are doing fine. I had the most beautiful plants in my garden this year, and there was not enough time for them to go to seed before first frost. Granted, I am in S. Alabama, but Baker Creek had said I was far enough south for them. Sad. What growing conditions does this plant favor? I bought one this weekend, and it looks to be too big for its container. I am hoping to take some cuttings from it before I transplant it. Do you have any tips on rooting the cuttings? Do you think it is worth the effort? I wouldn't bother with cuttings except for fun: this plant is a long-lived annual and rarely goes through two years. Plant what you have, then save the seeds in the fall (let some dry in the pods while still on the plant) and plant those seeds next year. And… it's easy. Full sun, some decent soil and it will grow. Thank you! You helped me gather the information I wanted for all my new plants – by way of your videos, blog posts, or comment replies 😀 Now, I must decide where in the yard to plant my moringa, the banana, the plantains, the pineapple guavas, cranberry hibiscus, roselle, chaya and cuttings, and papaya seedlings. Very exciting! You didn’t mention how much water this plant likes. Please reply asap, as I am getting ready to plant some . Really looking forward to seeing it grow to maturity, since you’ve described how beautiful it is. Moderate water is fine. I’ve had them grow on rainfall alone, but they’ll grow faster if you give them some water 2-3 times a week, more when they’re little. Thanks for the info, David! As usual, you have Good information 🙂 Hope you and your family are well. Going to harvest a few of my calyxes and see if there are any seeds, will try preparing some things with them, too. Hello David, thanks for all the great info. This started growing in my garden all by itself and something told me not to pull it out that it was special. When it got the maroon buds all over it. I really got excited and then the blooms popped out and excitement turned to delight. I am going to try some recipes with the calyxes and save some on the bush for seeds now that I know how cool and delicious that they are. I live in Ocala, Florida and this plant must have been planted by the birds or something. If I harvest the seeds when should I remove them from the bush and when to plant them for next year? I also am a member of a plant swap in central Florida and got some of the Cranberry Hibiscus with the red leaves I think they also have the same edible properties don’t they? Wait until the pods dry out on the plant, if possible, then save the seeds. What a wonderful thing to have show up in your garden! The cranberry hibiscus has edible leaves but is a perennial. It also doesn’t have the good calyxes… just useful for leaves. I grew sorrel in SC, harvested some pods and made a delicious drink from it. I picked and cleaned the calyx blend the fresh calyx with water, the juice of a lime, piece of cinnamon and some ginger. Left in the fridge over night. Next morning I strained and added some honey and a bit brown sugar. It was the most delicious batch I ever drank. I grew up in the Caribbean growing and making sorrel drink. I started my seeds indoor then transplanted the the temperature in SC(Conway) was suitable. That’s fantastic! Great work. You’re way up there for the plant’s range and you still pulled it off. Sorrel drink is the best. Thank you for the growing report. Just found this. In case anyone’s interested in even less food waste, the green seed can be washed and boiled in a cover water, to make soft Pectin. Similar to Amla/Amloki/Cranberry seeds/Apple Peel. Amazing you left out its best use to drink, rather than time consuming jelly and such. Sorrel, also called Hisbiscus, Jamaica, and Karkade (or spelled with a ‘C’), makes an amazing alternative to kool-aid, and you can sweeten it anyway you wish and keep some sugar out of yourself and your kids. It tastes fruity and good, and sometimes it is brewed with cinnamon and other such spices (apple pie or pumpkin pie type spices), and lime, and is wonderfully naturally tasty and deep red with NO artificial chemicals or preservatives. Your kids won’t even know its not Kool-aid if you make it secretly! It can be brewed like hot tea or cold/sun brewed over night or a few days. Run some web searches using the terms above, and you’ll find a whole new world of great drinking. And yes, it can be made into cocktails or sangria. Love this plant in all its ways!